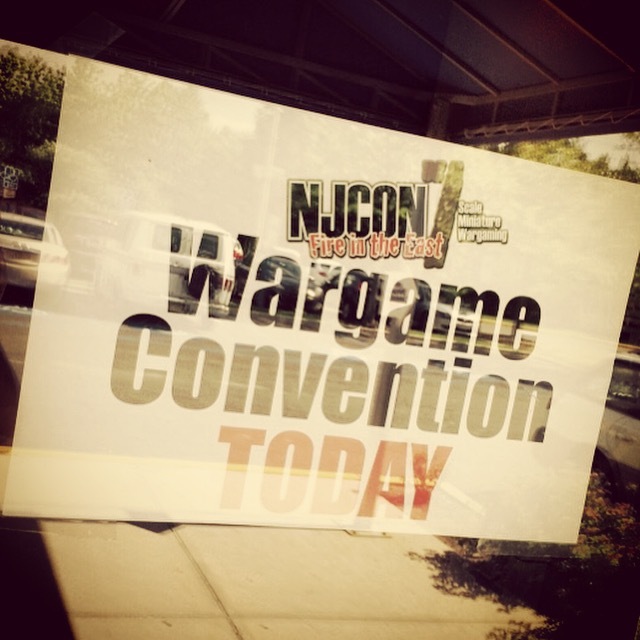 This past weekend I took my first trip to NJCon, just a quick one-hour drive from Metropolitan Wargamers in Brooklyn, NY. 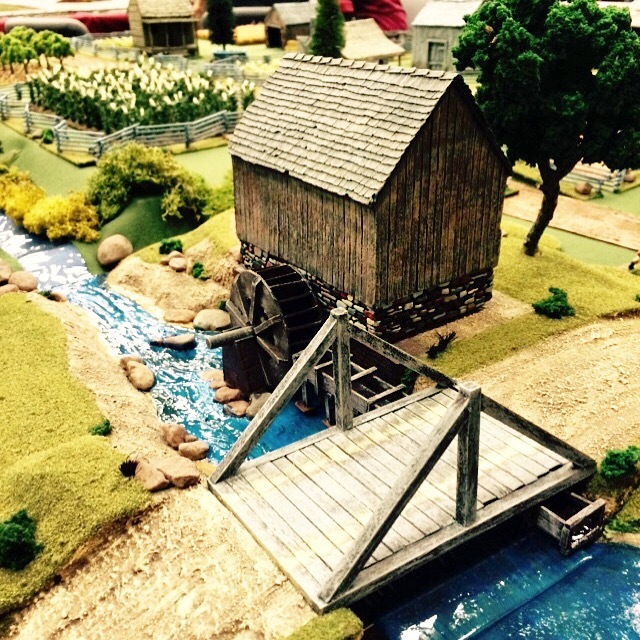 About a dozen current and former members of our club attended the Saturday events, held at the New Jersey Convention and Expo Center nestled in the sprawling suburban office and light industrial landscape of Edison, NJ. I was one of about 230 gamers who attended the weekend’s events, and I was greeted by a speedy and friendly registration badge pick-up experience early Saturday morning. From the main desk, a small room to the left held a tiny flea market packed with bargains and a wider door to the right took me through the dealer room of some half-dozen vendors and on to the main event space holding a couple dozen tables. 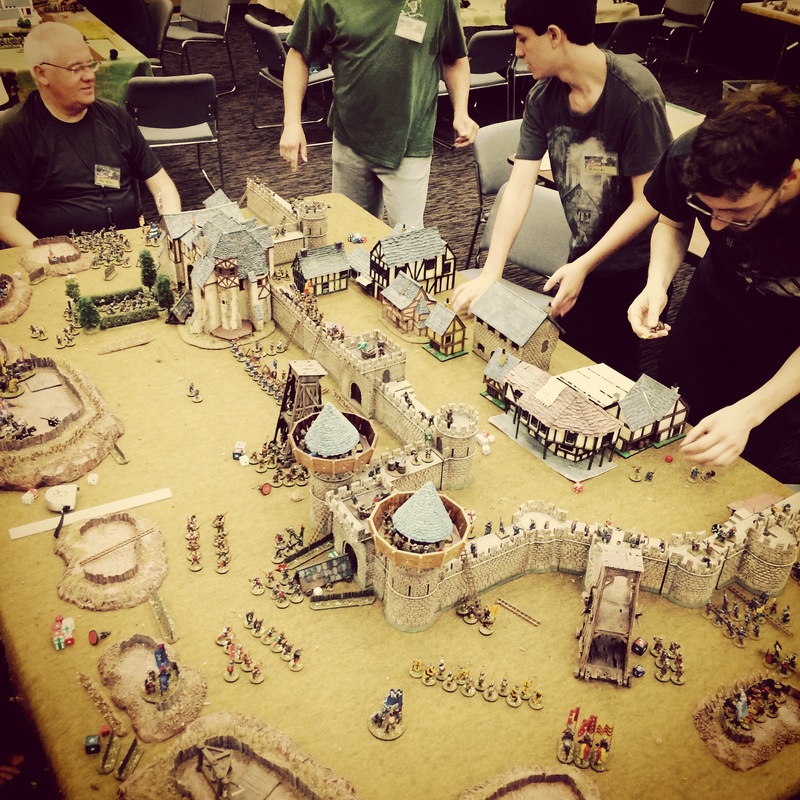 Small Flames of War, Saga and DBMM Ancients tournaments ran for most of Saturday in curtained areas and side hallways. 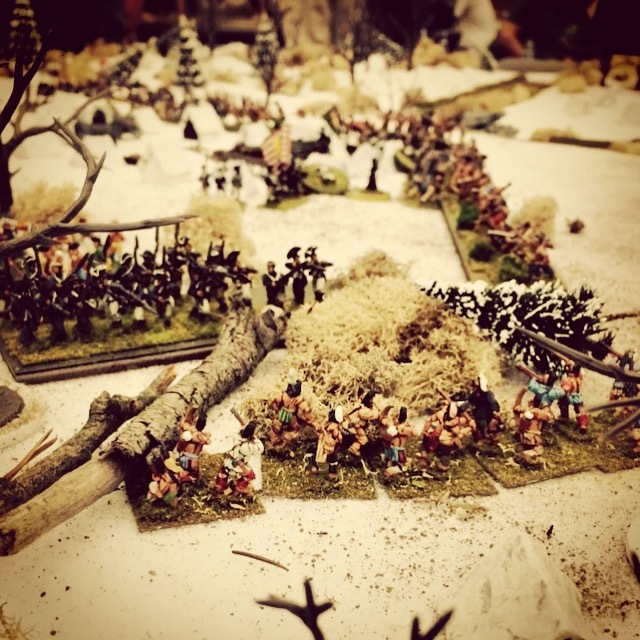 Overall, the con had a traditional wargaming feel where historical miniatures of multiple eras in 6mm, 15mm and 28mm scales dominated the weekend while also accommodating a good smattering of sci-fi games. I jumped right into a 15mm Torgau 1760 game and experienced a crushing defeat over the next four hours as my side’s Austrians relived a historic defeat by the superior might of Frederick The Great’s Prussian forces. 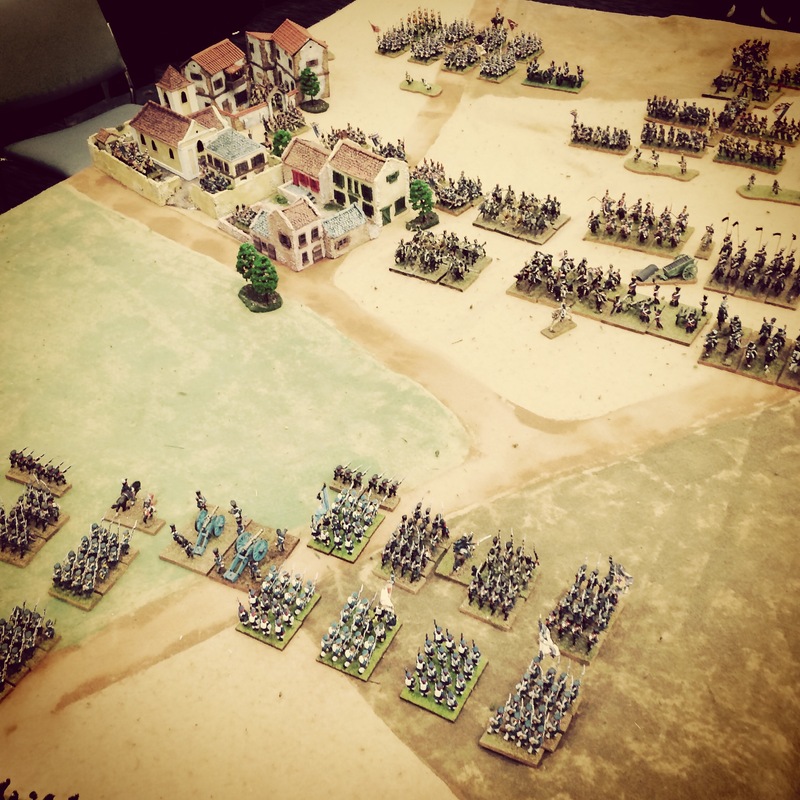 My gaming partner and me, big fans of 18th-century warfare, really liked the command mechanics in the Might & Reason rules despite the overwhelming strength of the Prussians within the game. Even with the loss, the game was good a introduction to the rules as GM’ed by a very accommodating Ben Campbell. 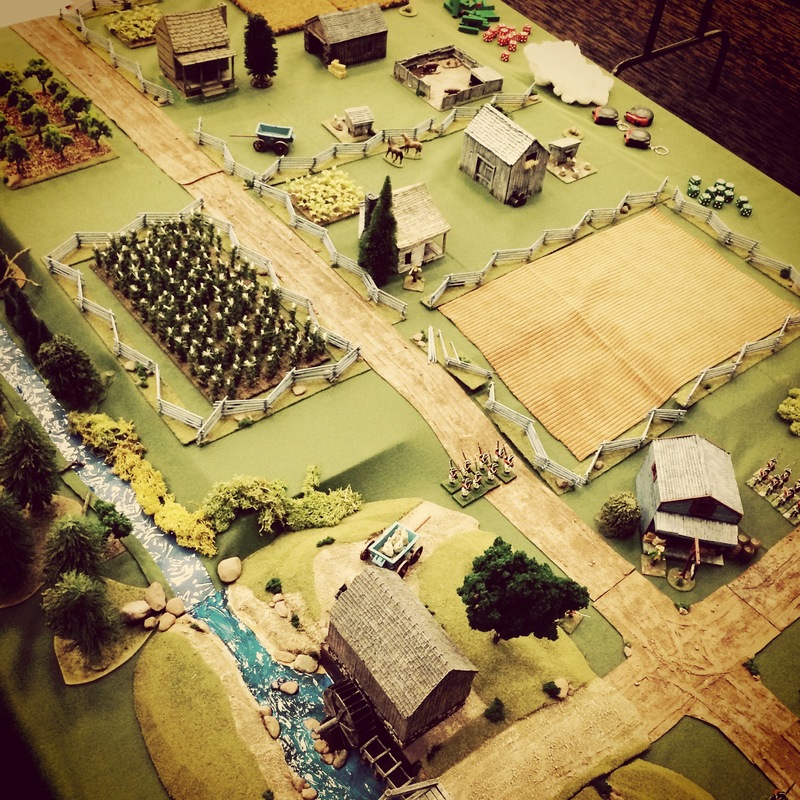 At nearby tables, other morning games included a gorgeous 15mm American Civil War game held over from the night before using Fire & Fury rules and an Operational Pedestal game using modified Naval Thunder rules. 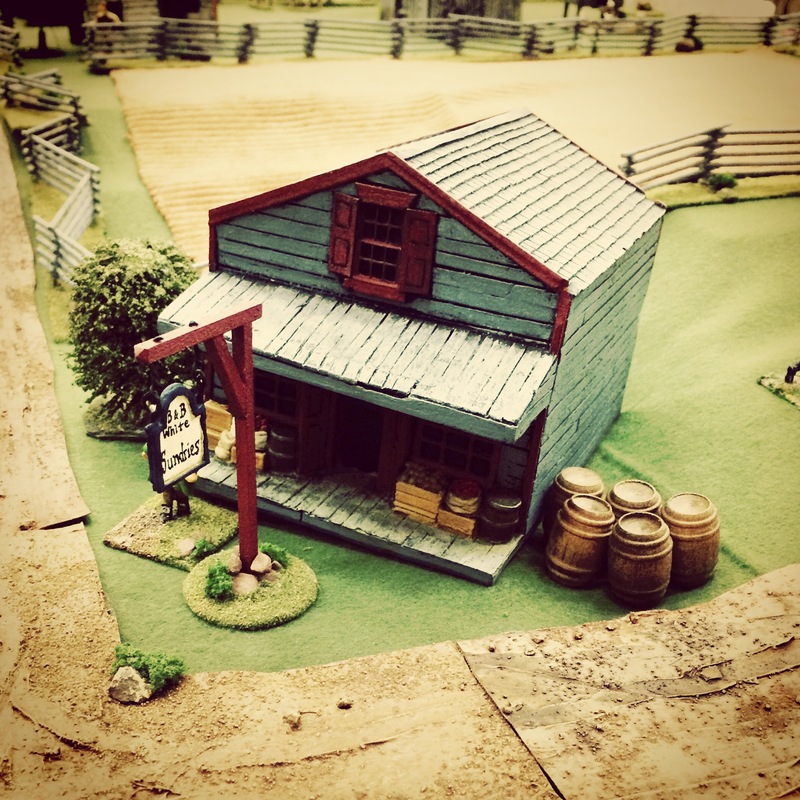 For my next game, I moved on to the summer of 1779 for a Muskets & Tomahawks game in 28mm at Tinton Falls, NJ. Playing as the Tories with regular and British-sympathizing irregular troops, my team’s mission was to burn the local mill and capture four local prisoners loyal to the Colonial rebel cause. 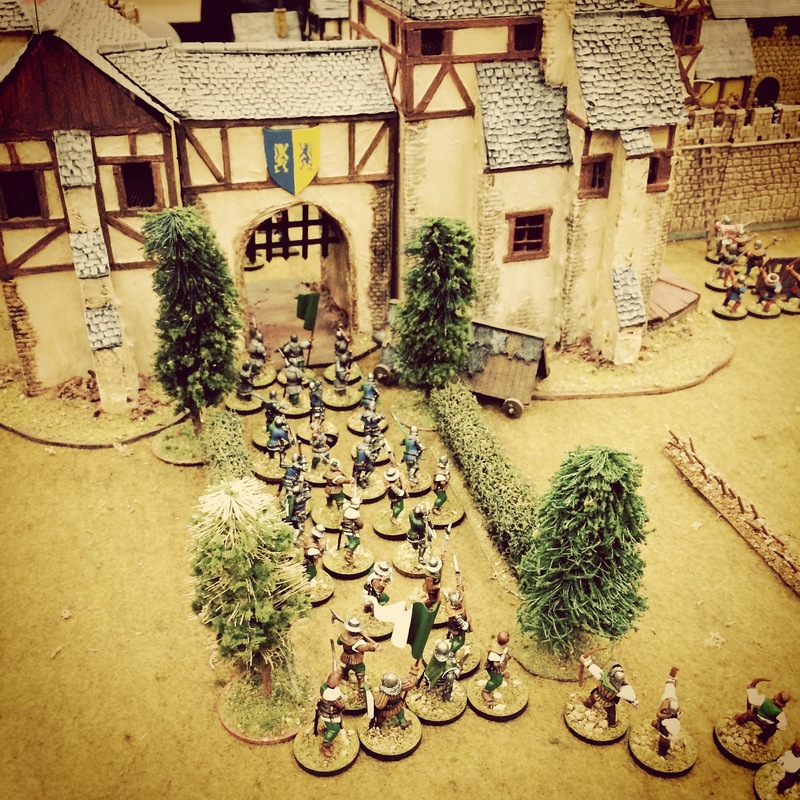 The gorgeous game proved to be a challenge as the red-coated Tory regular force’s effectiveness amid the town’s buildings and tight farm roads was limited. 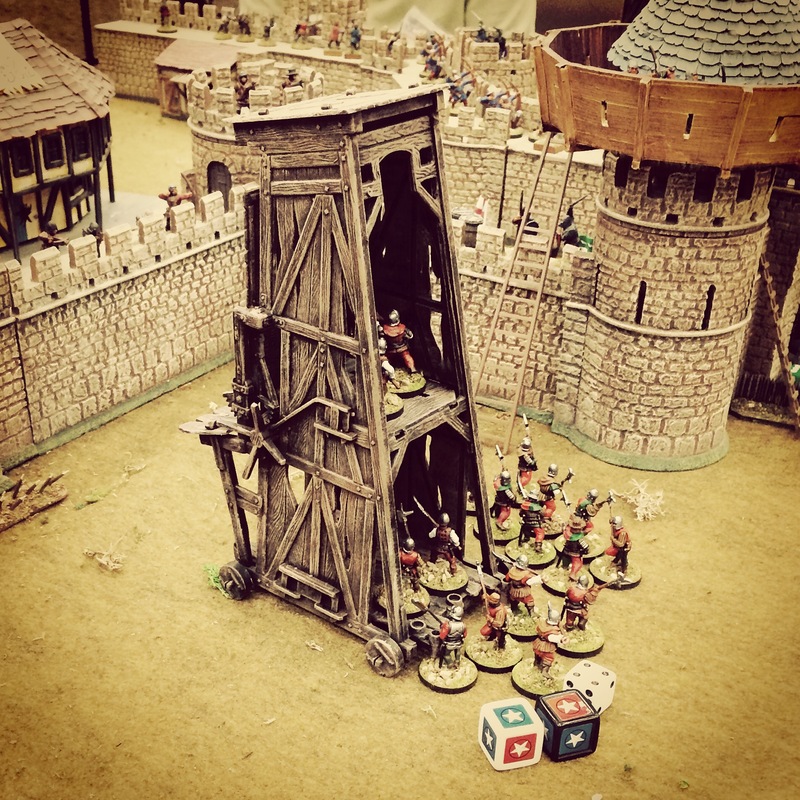 The Tory irregular troops did an incredible job holding the rear of the Tory column against multiple attacks by Colonial militia, but ultimately it was a no-win situation for the Crown that day. 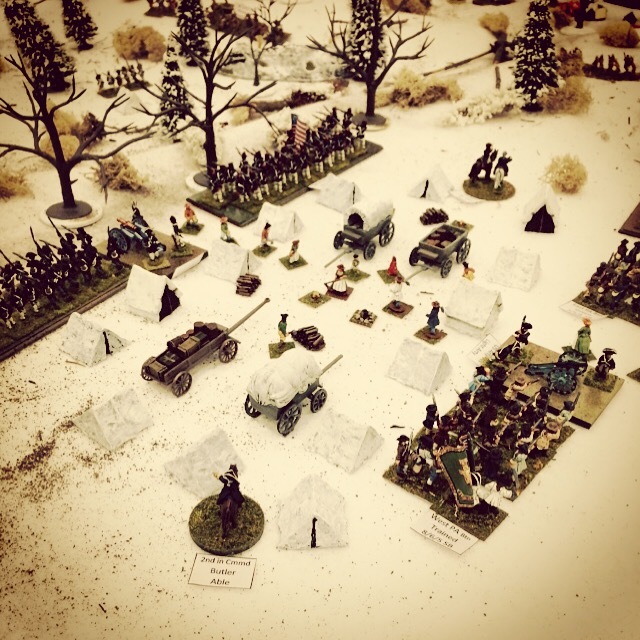 While I continued on in my 18th-century games, other periods were being fought all around me. 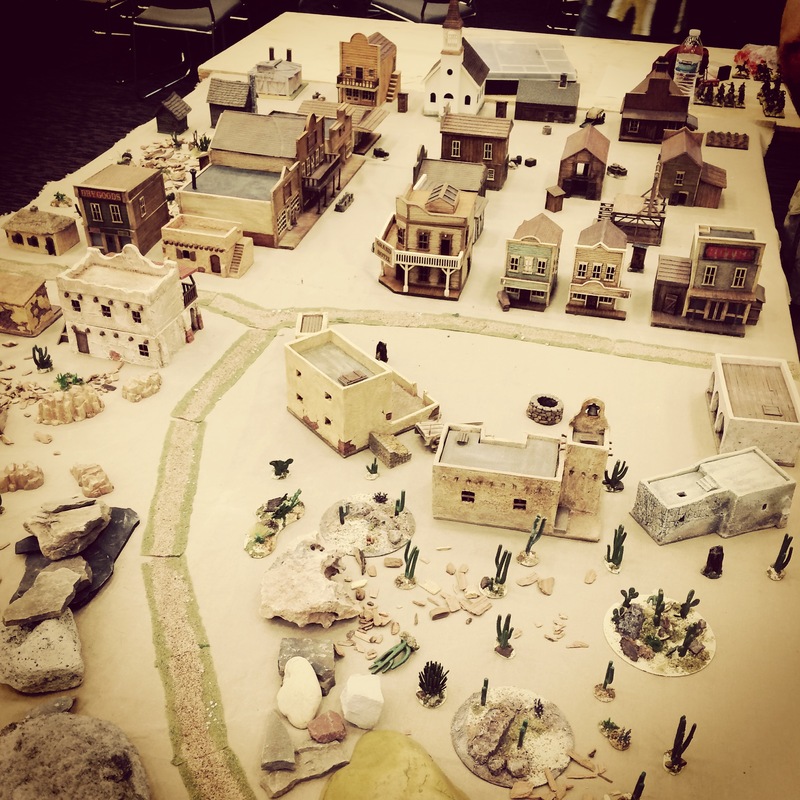 Other incredible 28mm games featured a Wild West gunfight on the dusty streets of Deadwood and Joan of Arc’s attack at Jargeau 1429. 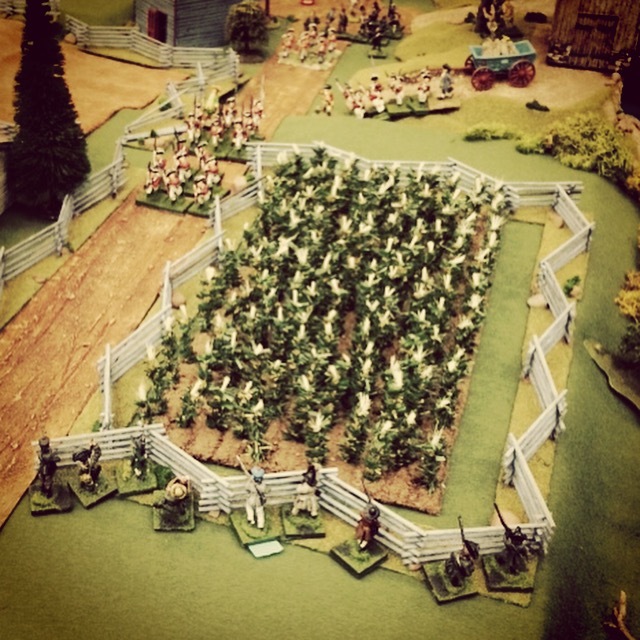 Along one whole wall in the main gaming hall, multiple Waterloo-themed games ran throughout the weekend in tribute to the battle’s 200th-anniversary this month. 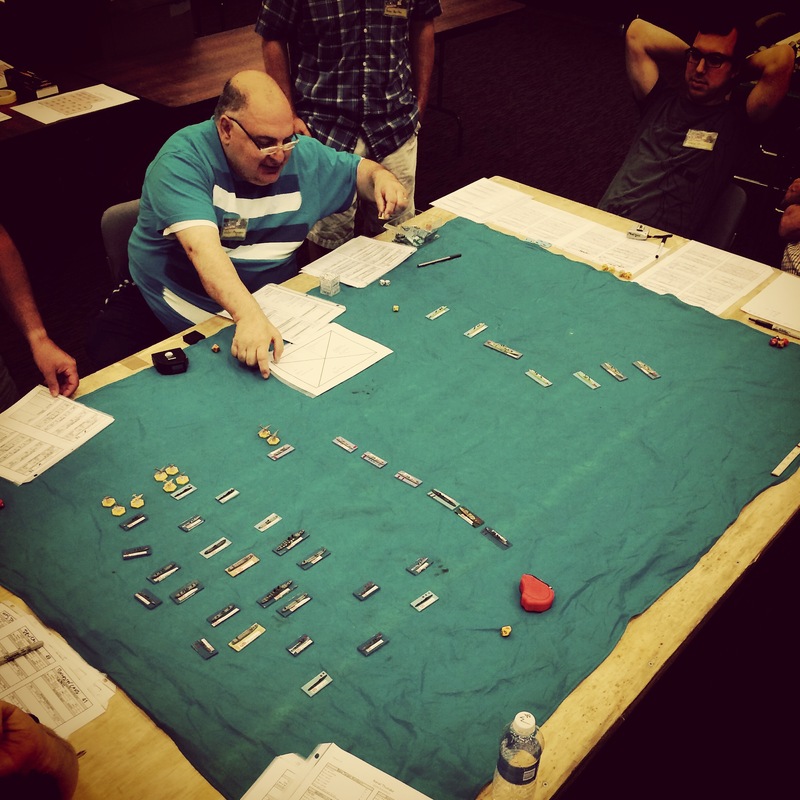 In a side room, an enormous Stalingrad game ran for most of Saturday in 6mm. 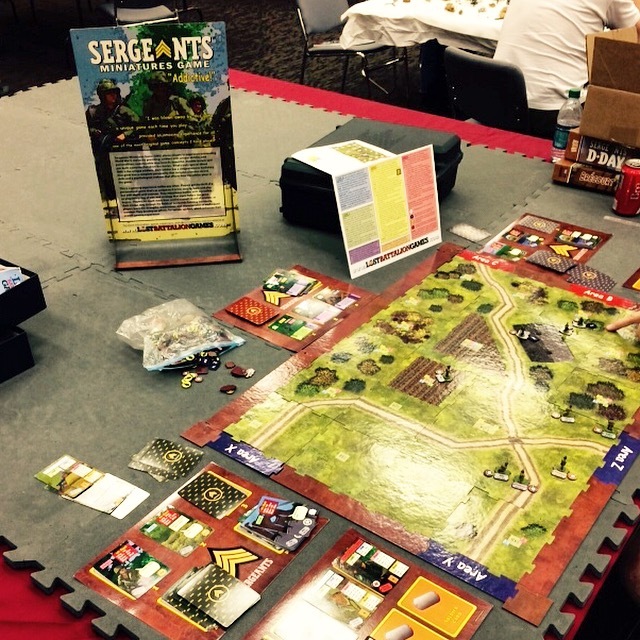 After two losses in the 18th-century, I got into a World War II game with my first spin through the popular Sergeants Miniatures Game. 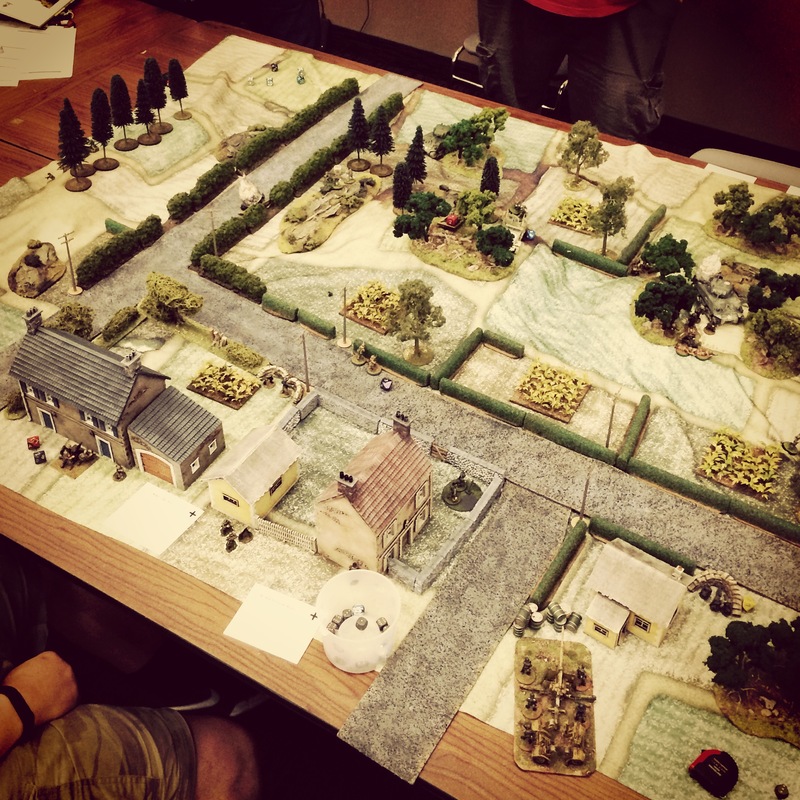 WWII is my go-to period, and I play miniatures games in 6mm, 15mm and 28mm scales using multiple rules systems, but I had never played this particular board game before. I enjoyed the card-driven mechanic with no charts, no dice and a quick learning curve. 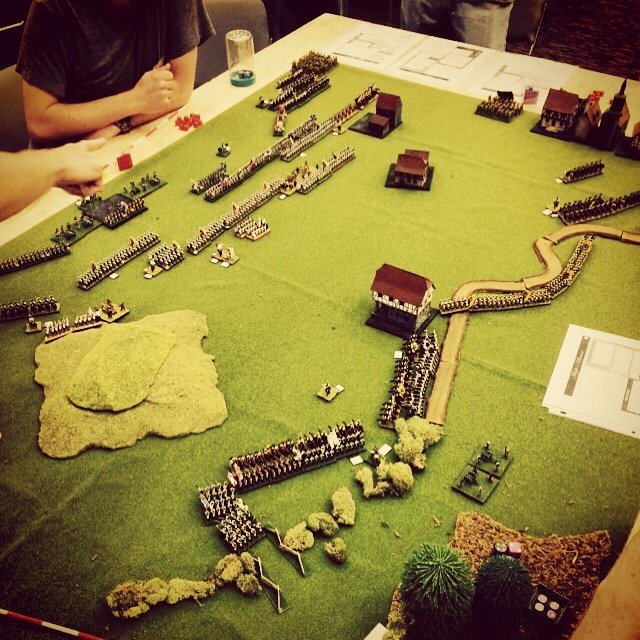 My superior 101st Airborne troops using combined-arms made easy work of the Germans of my teacher opponent, and I’d definitely give this game a try again as a palate-cleanser among more traditional WWII miniatures games like the Bolt Action game which for most of the afternoon into evening. With my games for the day at a close, I joined a couple of my club mates to observe what I consider to be a stellar example of the epitome of convention miniatures gaming. 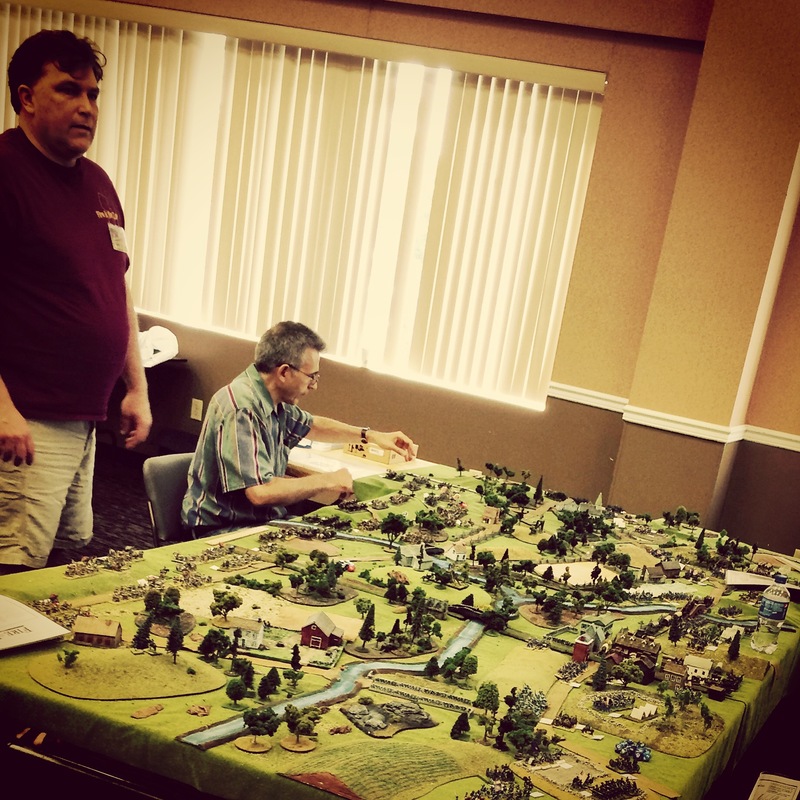 Troy Turner and Bill Miller presented the Battle of the Wabash 1791 which is infamously known as the greatest defeat in the history of the US Army at the hands of allied Miami, Shawnee and Delaware Native American forces. 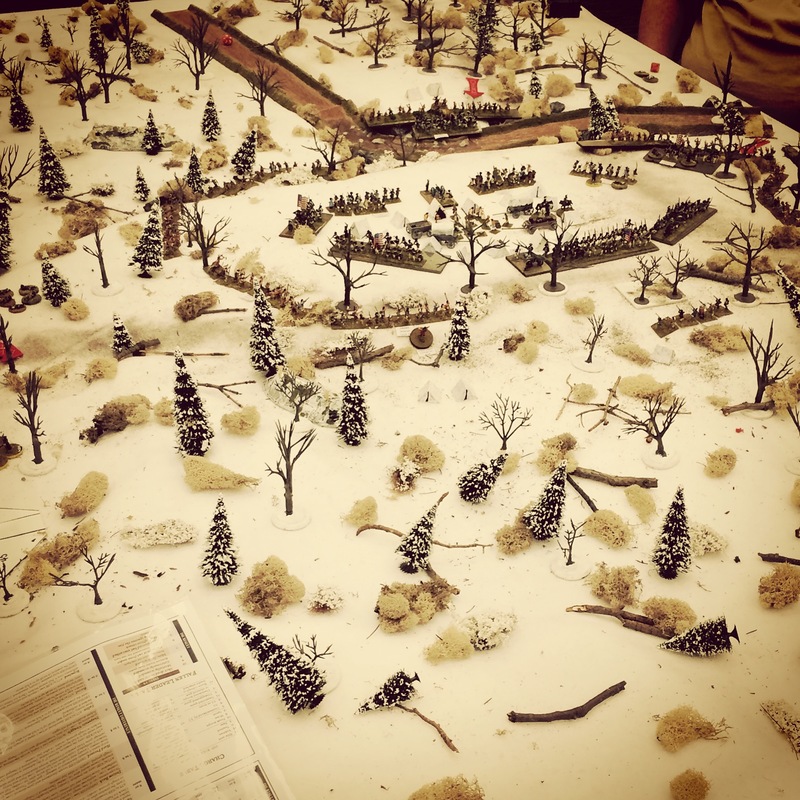 The game featured hundreds of beautiful 15mm miniatures strewn through crowded snowy forest terrain and was played using variant Fire & Fury rules. Troy and Bill were wonderfully entertaining hosts for the game, demonstrating both a dark sense of humor and a deep understanding of the battle’s history. 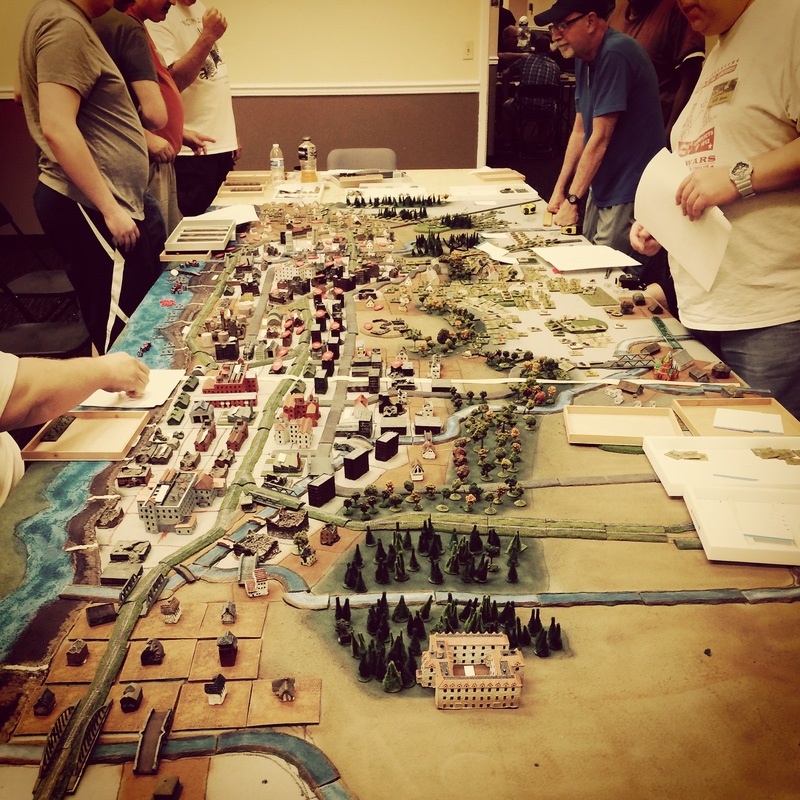 The game represented the best in the show for me since this is the kind of game you would only see at a con and probably no person would want to play such a lopsided and somewhat obscure battle at any other time except for at a convention of avid gamers and passionate military historians. 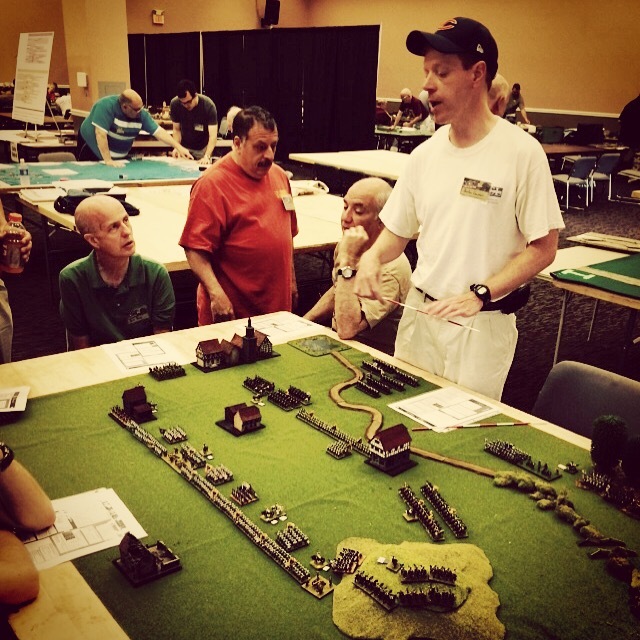 Overall, my first visit to NJCon presented a classic miniatures wargaming event that spoke to the traditionalists in the hobby. 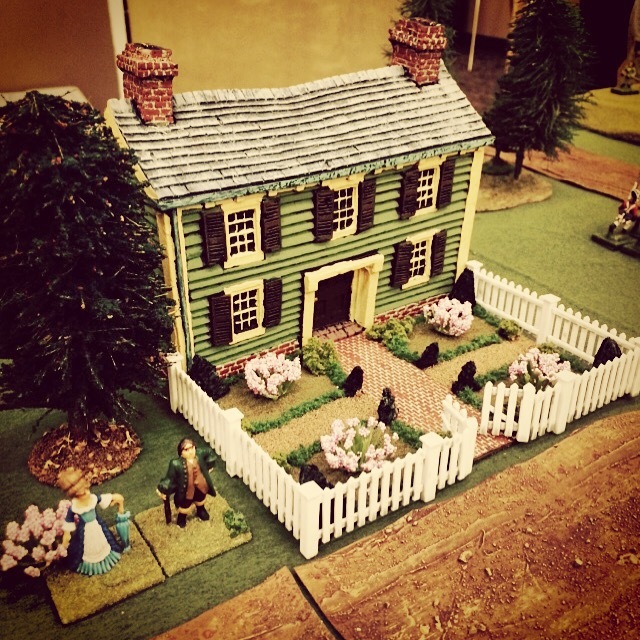 As a small alternative to the big HMGS conventions I’ve frequented over the years, the trip to New Jersey this past weekend felt very much like a return to the roots of the hobby for me. Thanks Ben for the very gracious write up. It was nice to see some new faces and meet some fellow enthusiasts. NjCon has taken the place of Historicon for me. I would encourage everyone to give it a try. I look forward to gaming with some new friends! Hey Troy — it’s actually Kimber (Ben and Brian’s friend who observed your game). Great stuff and I hope to see you at Fall In! Great write-up. Thanks for the kind words.